Shrimp, which is relatively low in saturated fat and calories and a good source of selenium, vitamin D and omega-3 fatty acids, can be a healthy food to include in your diet. 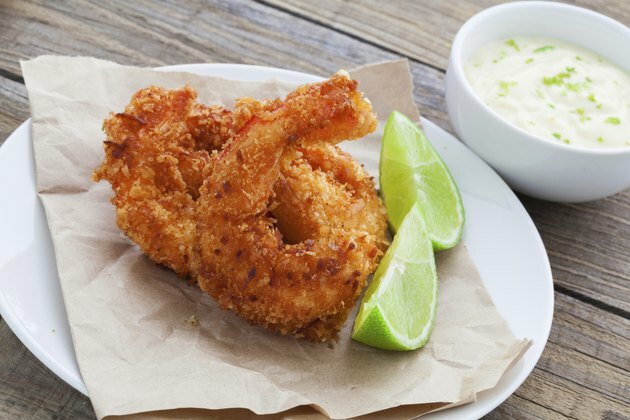 When shrimp is dredged in a coconut batter and deep-fried, however, the result is a lot of unnecessary calories and fat, making it more of a splurge food. Just one homemade coconut shrimp contains 126 calories, 7 grams of fat, 134 milligrams of cholesterol, 2 grams of carbohydrate, 13 grams of protein and 0.5 gram of fiber. A coconut shrimp appetizer from one national chain restaurant contains 530 calories, 36 grams of fat, 34 grams of carbohydrate and 18 grams of protein. Dipping your coconut shrimp in a tasty sauce will add even more calories to this dish. Your best bet is to eat your shrimp grilled or broiled, but if you choose to indulge in this crispy treat, consider splitting an order with a friend.